My colleague made risotto balls a few nights back and came to work raving about them—I know the name sounds bad, but she swears they are amazing! And my hubby loves risotto, so I can’t wait to try these. Other chefs I’ve found online call them arancini. Check out this article and recipe. Yum! I know it sounds crazy, but I’m already thinking of holiday parties and my family’s Christmas celebration—yes, I’ve started the menu for this year. Don’t judge! Last year I started planning in July and it turned out fabulous, so I feel the need to start early again. This year my aunt is hosting, but I’m doing the planning. Perfect for me! Check out a few photos here. 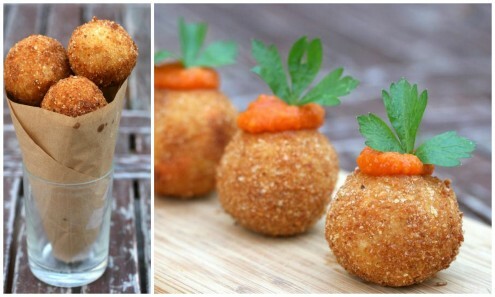 How fun would the risotto balls be served in a martini glass with the sauce drizzled over them for a party or dinner party (similar to above)? You could even do them the night before and just bake and/or broil them before serving. So yummy! Here is the recipe Carly followed. I’m definitely adding this to the Christmas Eve appetizer list! In a large pot or Dutch Oven, heat oil to 360 degrees F-370 degrees F. (Use a deep fat or candy thermometer to gauge the temperature). Put flour, eggs and bread crumbs in separate bowls. For each risotto ball: roll in flour and shake off excess; dip in egg and let excess drip off; roll in bread crumbs; transfer to a baking sheet lined with waxed paper. Using a metal slotted spoon or skimmer, lower six balls into the oil. Fry until golden brown, approximately 3 to 3 1/2 minutes per batch of six. Transfer to a paper towel to drain. Repeat until all the balls are fried. 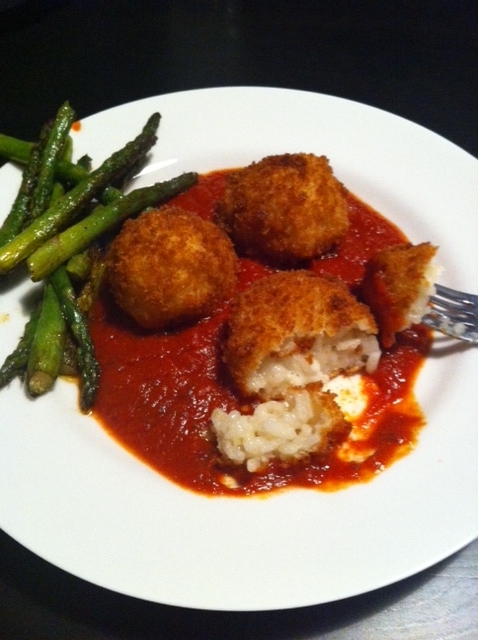 The risotto balls are best if served immediately. They may be held in a 250 degree F oven while the remaining balls are fried. The recipe is from FoodChannel.com. Enjoy!